There's absolutely no point in trying to build suspense about whether or not we at Destructoid like I MAED A GAM3 W1TH Z0MB1ES 1N IT!! !1 (hereafter referred to as IMAGWZ1T!). We do. It is, quite simply, amazing. The only real question then is, why? What makes this title one of the freshest things to come out of Xbox Live's Indie Games community in some time? You probably already know the answer to this too, but I'm going to tell you anyway. And I'm going to do it after the jump. As the game cheerfully announces on the title screen, IMAGWZ1T! 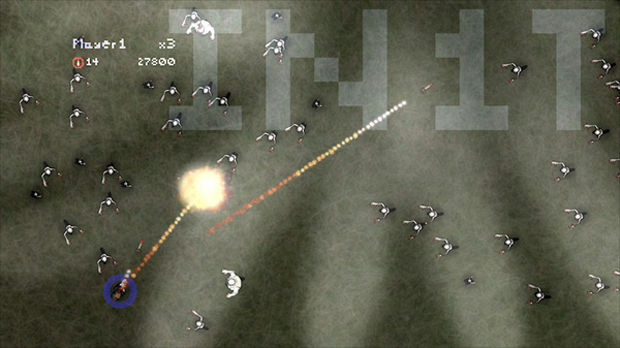 is a dual-stick shooter. While a dual-stick shooting game with zombies as the main enemy type is nothing new at all, this particular game has a lot of things going for it which make it quite special. First and foremost is the music. While you play, you are treated to a self-referential diddy where the singer explains that he has made a game with zombies, that it's only a dollar and he hopes you buy it. It is, quite simply, hilarious and you have likely heard it by this point. Just listening to the song, however, does not compare to actually playing the game, where the pacing is directly relative to that backing track. In parts of the song which are faster and more intense, greater quantities of enemies assault you. 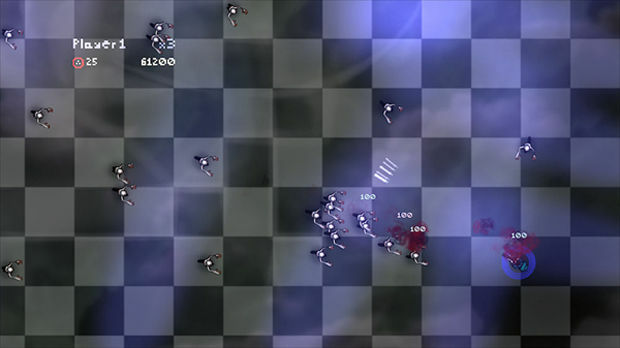 In addition, the music will even change to be appropriate to the types of enemies you are fighting. While IMAGWZ1T! 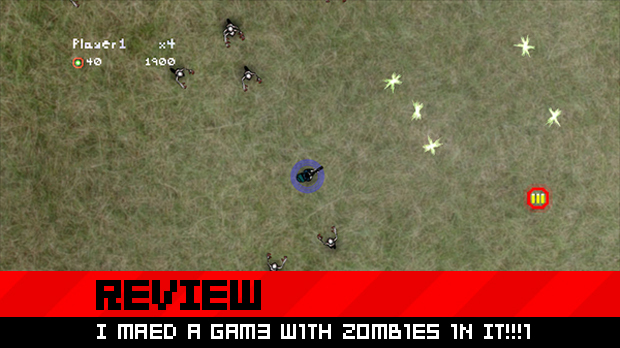 does feature a ton of zombies in a few different varieties, it also has enemies which will be familiar to players of other top-down shooting games and the tune switches up to resemble the aural feel of those titles. A section in which rhombuses swarm about has a more ambient electronic feel to the song, evoking the feel of a Geometry Wars game, while the music drops down to a lull when facing off against asteroids. It's a level of creativity that we don't often see and is highly welcome. The nature of the game's limited playtime, which lasts only for the length of the backing musical track (roughly thirteen minutes), makes it feel like a cohesive whole. While the game is easy enough that one could play for far longer, that is clearly not the goal. It's focused on giving you a unique experience and by refusing to allow the player to continue for longer than its strictly limited length, it avoids the trap of becoming stale. In terms of graphics, yeah, there's nothing to get excited about. James Silva's artistic style is evident in the design of the zombie enemies and the player-controlled character who kills them, but everything is so small and frantic that it's really hard to appreciate. The variety in enemies and the designs of some of the stranger things you shoot are charming, however, especially for anybody who has spent time playing games where ASCII characters are used to represent the whole of the visual design. Were it not for these things, IMAGWZ1T! would be generic and droll. The weapon selection, though broad, shows little creativity and sticks mostly to the staple shotgun and machinegun types. A flamethrower and largely unhelpful laser cannon also exist but nothing there is particularly inspired. They get the job done, certainly, and there's hardly any reason to reinvent the wheel with the equipment in the face of the other clever aspects at work here. The only issue I have with this game at all is in its multiplayer. Due to the field of play being so large, as players move away from each other the display zooms out to accomodate everybody onscreen. There really isn't any way around that other then splitscreen, which would be terrible, but it can become a problem since the zoom really only goes out just far enough to keep everyone on the same screen. So, the moment you start to move out, all players are disadvantaged by being unable to see incoming enemies on one or two sides. Of course, if you're taking the game seriously enough that this honestly bothers you, you're missing the point anyway. I MAED A GAM3 W1TH Z0MB1ES 1N IT!! !1 may well be the best dollar you spend on a videogame this year. The catchy song and surprising variety in enemies make it an absolute joy to play and it's excellent for when you need a quick fix of something wacky to brighten your day. There's no excuse whatsoever for you not to at least try the demo and the low entry price for the game makes it a painless decision.